Mitchell's player profile has an eerily similar NBA comparable: Josh Smith. Smith was a high school-to-pro first rounder in 2004 and has been an enigma in the league ever since. In spite of his myriad athletic gifts, Smith is notorious for off-the-court disruption and on-court malaise. Though his defense rarely wavers, offensively, Smith can quickly fall in love with his jump shot and become an ineffective ball stopper. Even with all of these concerns, Smith is still a player that gets considered for max contracts because of his ability to take over games, and someone the Pistons are in hot pursuit of. Nothing from Mitchell's summer league performances argue against that analysis, as evidenced by the tomahawk pictured above. Mitchell is a project, but one that the Pistons may be uniquely equipped to shape. Though we're yet to see his real influence on young players, Rasheed Wallace's presence on the bench could help stabilize Mitchell's effort in addition to correcting some of his on-court flaws. Namely, for all of his athletic gifts, the rookie power forward had a tendency to settle for outside jump shots during his sophomore season. To wit: he took 100 three pointers during the season (3.125 per game) and managed only 157 free throws. 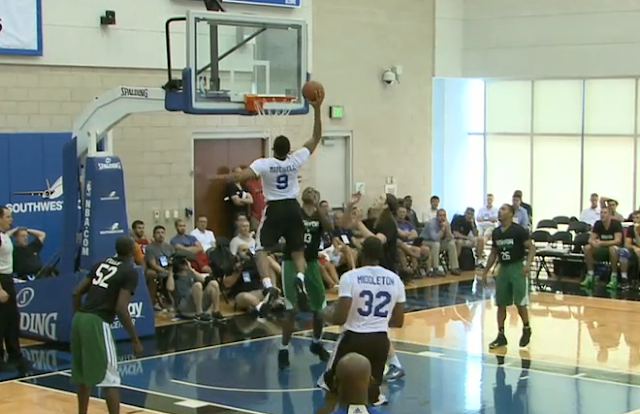 This is not indicative of a guy who plays above the rim as effortlessly as Mitchell. Offensive decision making notwithstanding, Mitchell's gifts make him an exceptional defensive player. Averaging 2.7 blocks per game during his sophomore year was actually a step down from the 3.0 mark he posted during his freshman campaign. Mitchell is the kind of player that defends with reckless abandon, attacking ball carriers, protecting the rim, and skying for rebounds. Unfortunately, as we saw a bit in the summer league, he was getting lost in pick and roll defense, something he'll have to correct if he wants to see any playing time this season. Mitchell is a raw prospect, something the front office knew when they drafted him. After trading for Josh Smith, his potential minutes evaporated, which isn't all bad. Mitchell needs a significant amount of time to adjust to NBA life, learn the defensive system, and refine his offensive game under the tutelage of 'Sheed and Smith. As the season progresses, Mitchell may find some minutes opening up, especially if the roster thins out with trades (as I'm expecting it will relatively early). With the athleticism and talent to be a long-term contributor in the league, Mitchell's success will rest on his mental development. Mitchell may be the best young asset that the Pistons have on their roster. While Kentavious Caldwell-Pope projects to be an immediate contributor, Mitchell's potential make him both a boom-or-bust prospect and an intriguing potential trade piece. Josh Smith currently inhabits Athletic Wing position in the Pistons rotation, and competition form Luigi Datome and Charlie Villanueva will keep Mitchell from seeing playing time early, but when Joe Dumars inevitably deals some of the teams haphazard expiring contracts, Mitchell should be primed to take on a bigger role in the rotation.